As close to war as you can get. Last weeks RBC Film Club “after film discussion” was far more enjoyable than the film. 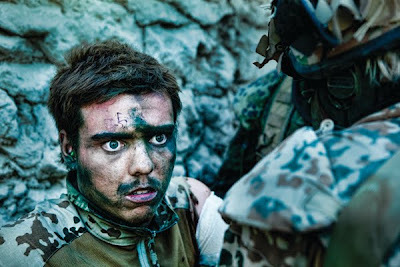 Armadillo (2010) is a very heavy going Danish documentary film about the Danish military on duty in Afghanistan. It follows a group of soldiers on their first mission in Helmand Province. The film open’s with the young combatants saying an emotional farewell to their families, from there we move to a farewell party that involved naked ladies! The soldiers are then assigned a six-month tour at the Armadillo military base in Helmund province. The director Janus Metz and cameraman Lars Shree, at times with great risk to their own wellbeing, alternate between the boredom inflicted on the soldiers by long periods of inactivity and the obvious dangers of going out on patrol. While on one such patrol the Taliban are encountered and eliminated with the use of hand grenades and gunfire. We are treated to scenes of very dead Afghans and it was this incident that generated considerable controversy in Denmark with an independent investigation conducted to decide if the rules of engagement had been broken. The film is from the prospective of the soldiers who openly and honestly discuss their part in the killings. “As close to war as you can get” reads the tag line on the poster which is a apt description of this film and it certainly comes across more like a feature film than a documentary including the way its been edited, the use of slow motion and the somewhat dramatic score. Its nearest comparison is another highly regarded documentary, Sebastian Junger and the late Tom Hetherington’s Restrepo (2010), which follows an American infantry unit in Afghanistan’s remote Korengal Valley, although the shot of helicopter gunships does bring to mind Apocalypse Now (1979). A strange thing happened at the end of the screening on Monday night, as the final credits rolled to there close not one single member of the audience moved out of their seat, almost as if they were transfixed, but if my feelings were anything to go by it was a numbing sense of the futility of war that engulfed us.